In Excel, keep only the essential columns (you can add the others back later using VLOOKUP). In this example, some kind of ID (like PERMNO), Date and Return.The first row of the sheet contains the variable names. Save this file as type CSV (Comma delimited) *.csv, ignoring any warnings about features or multiple sheets. Close the file. 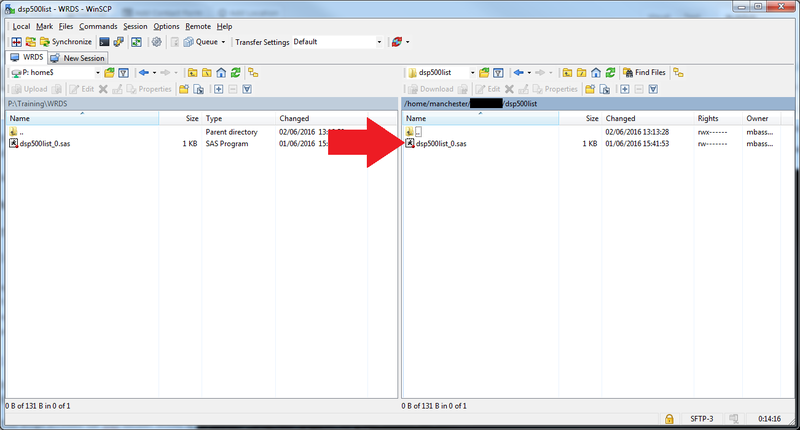 Open Stata, click File > Import > Text data (delimited, *.csv). Click the Browse button to select your CSV file the click OK. You will see a command like the following was performed: import delimited P:\Reshape\long.csv. You can look at a summary of the data by typing list in the Command window. 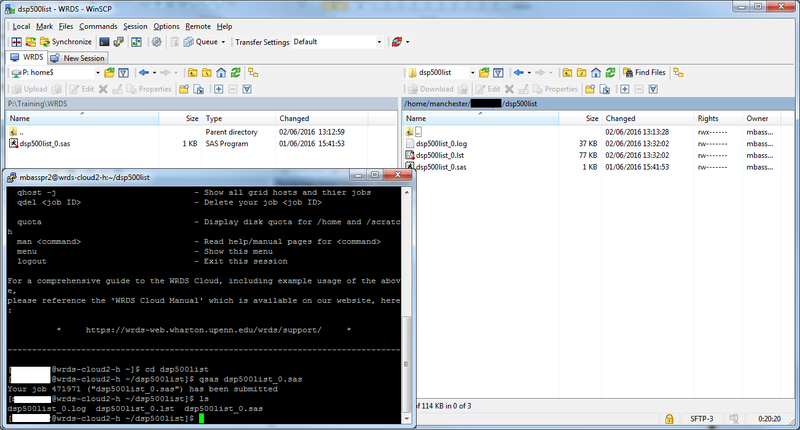 The reshape command in Stata works in two modes. Long: the reverse process, also called wide-to-long. After this is typed, you will get a summary of what just happened. If the text is in red, an error occurred, often if there are other variables that were not mentioned in the reshape command. You can list more than one variable to be reshaped (the command might then be reshape wide return volume price, i(date) j(id) for example). Again, you can type the list command to see the data. Now you have wide data in Excel! You can now open the new file in Excel to see the reshaped data set. The Institute for Digital Education and Research at UCLA have two excellent example pages, one for reshaping long-to-wide and one for reshaping wide-to-long. 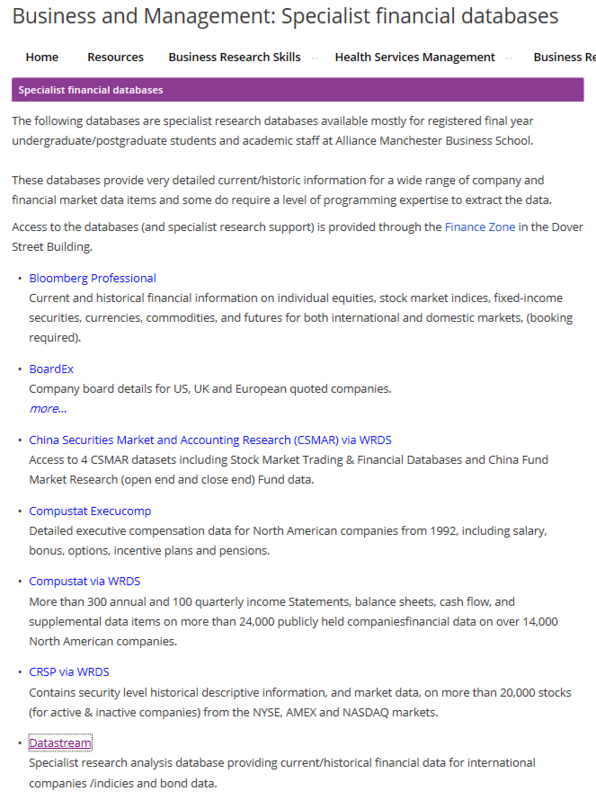 Following on from the refresh last summer, the Wharton WRDS web portal has been updated again. 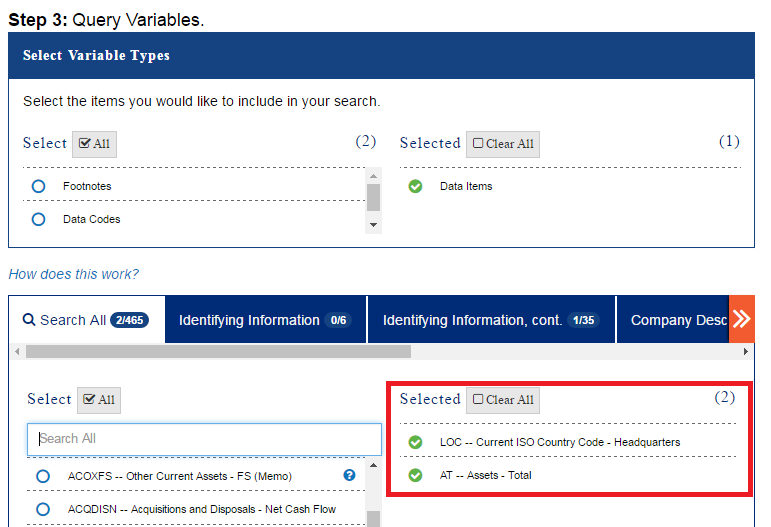 It is now easier to find and select the output variables you want to use in your request. The screen above uses the CRSP monthly stock database as an example. 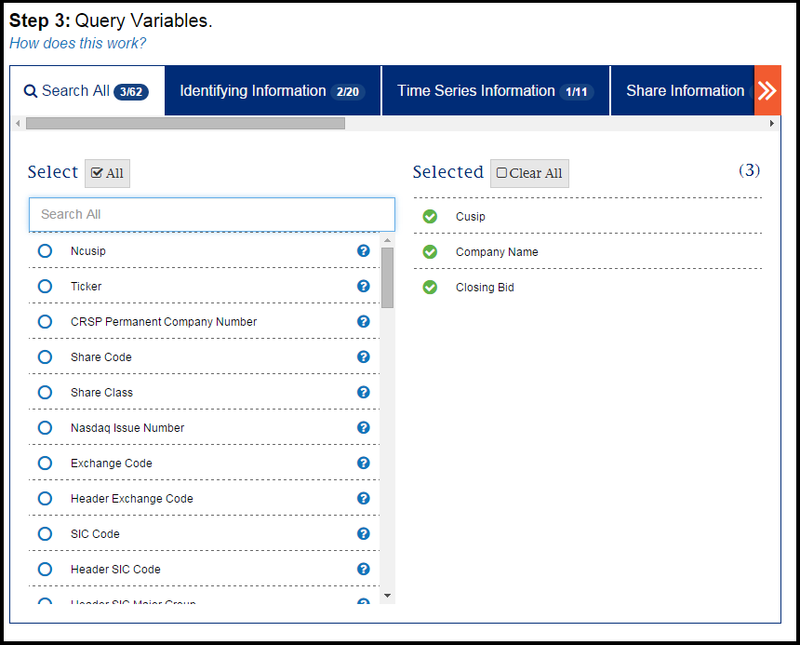 In the ‘Query Variables’ step, there are now multiple tabs containing categories of variables (which used to be listed in one column of boxes). The first tab contains all the variables, the subsequent tabs are categories like identifiers, balance sheet items, profit & loss items, and so on. There are orange and white arrows to scroll left and right between the tabs. There is a search field in the first tab where you can type the name of the variable or any substring of it. For example, type “code” to get any variable with “code” in its name, it does not have to begin with “code”. Tick each match that you want to use and it appears in the column on the right, labelled ‘Selected. You can browse through all the tabs and see the same master list of Selected variables appear in each. This is much easier than using the browser’s ‘CTRL+F’ find function that was required before. Another new feature is the Saved Codelists. Usually we recommend people upload a text file containing the codes for the companies (or other entities) that they wish to run a query on. 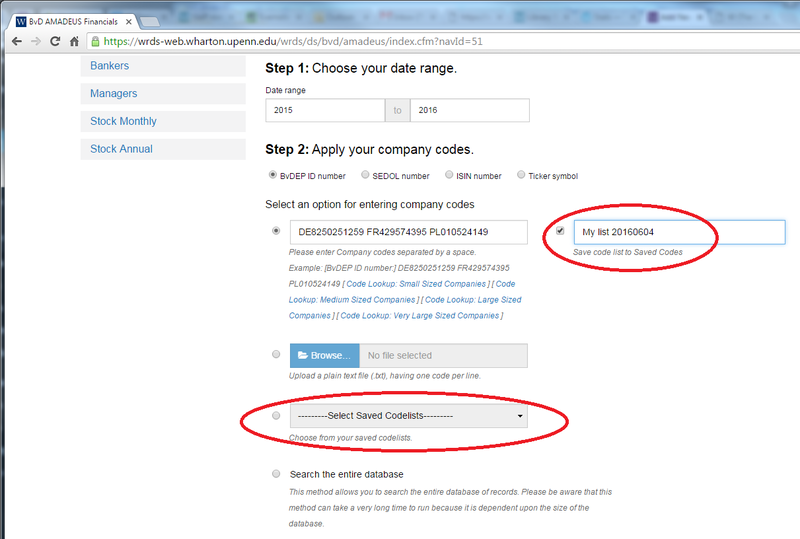 WRDS lets you type in or select companies one-by-one as well (useful for looking up a small number of companies). 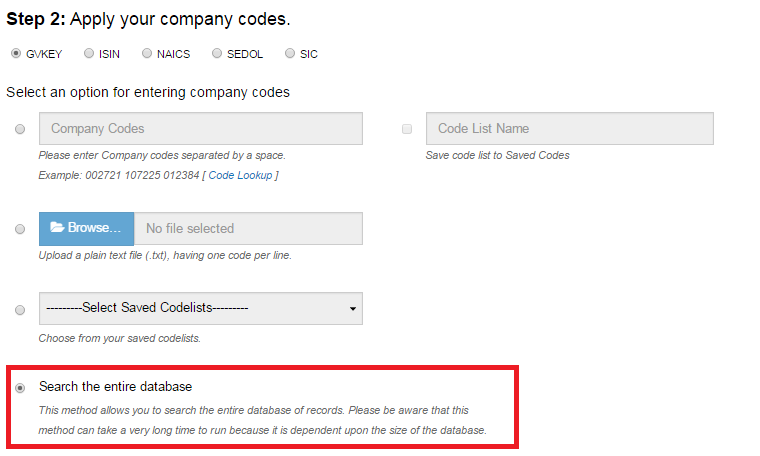 There is a blue link to ‘Code Lookup’ in most of the WRDS databases which lets you type the whole or part of the name of a company to find its code. The new feature is that you can save these short lists to use later. The screen above shows Bureau van Dijk Amadeus. Simply tick the first box highlighted in the image above (to the right of the codes) and type a name for the list. 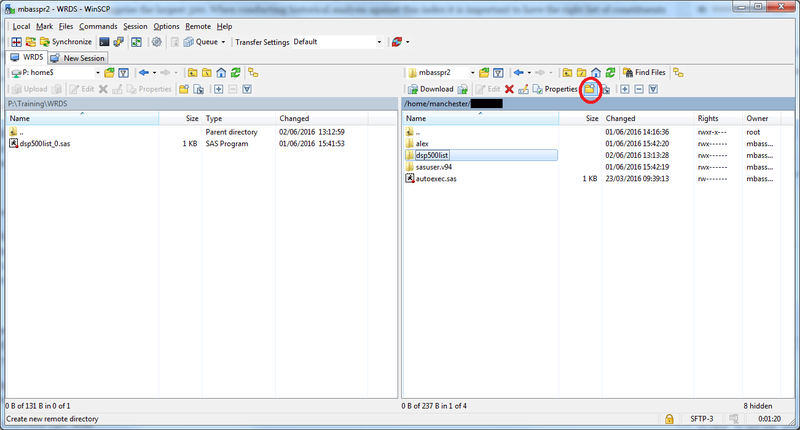 On a later visit to WRDS, you can find the list in the second box highlighted above, ‘Select Saved Codelists’.